In 1903 a major fire destroyed about half of Netcong's business district. Out of the ashes of that event a new Netcong emerged. The next few years brought the construction of half a dozen buildings, including a modern Fire House, a municipal water supply was installed along with electricity. In 1905 a new wood-frame Borough Hall was erected. 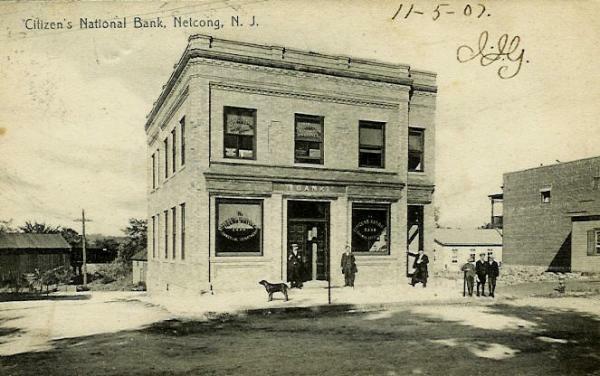 The establishment in 1903 of the Citizens National Bank of Netcong was a major step forward for the town. The area was growing, fueled by a busy schedule of the Delaware, Lackawanna & Western Railroad and the newly expanded Railroad Roundhouse in nearby Port Morris. 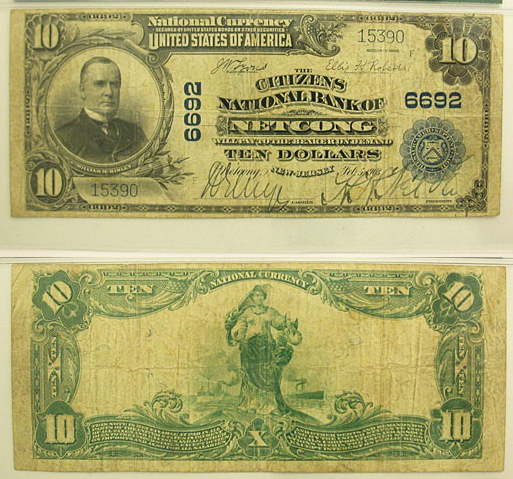 The chartering of Citizens National Bank by Federal Government allowed it to issue it's own "National Currency", examples of which are shown below. These were jointly backed by local Bank funds and the US Treasury. Many hundreds of banks were chartered. as seen on this Netcong NJ note, and Charter number, Netcong's was #6692. This style was used until 1906. Hugh McCulloch was a US Treasury Secretary, he died in 1895. Starting in 1863, the National Banking Act established a system of local National Banks which were chartered to issue National Bank Notes subject to federal oversight. With the upheaval of The Depression, the program ended in 1935. 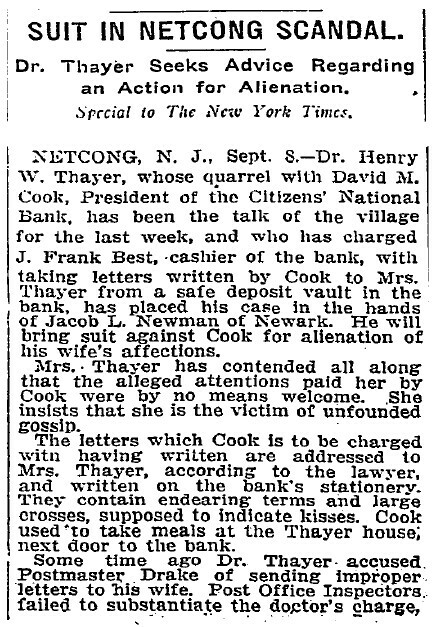 J. Frank Best, of Stanhope, the former cashier of the Netcong Citizens’ National Bank, who disappeared a few months ago, with about $4,000 of the bank’s funds, and was arrested last week in Chicago, is in the Mercer County jail in Trenton, held as a federal prisoner awaiting sentence. Best entered a plea of guilty before Judge Haight, in the United States District Court at Trenton Thursday of last week and was arraigned for sentence. He appeared without counsel and asked the court for an opportunity to confer with former Senator Jacob. C. Price, of Branchville, for advice before being sentenced. The request was granted, and Tuesday of this week was fixed for sentence. 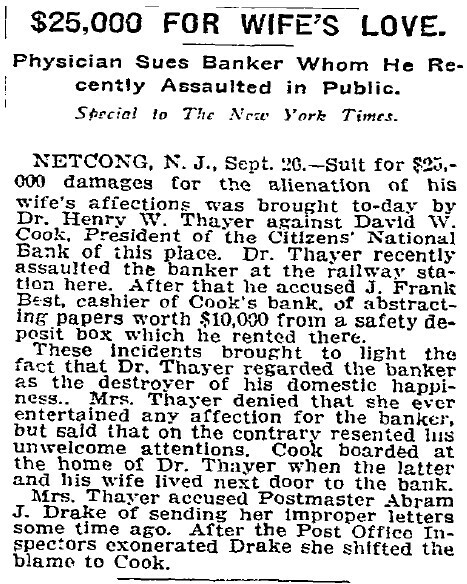 Since the arrest of Best, the officials of the Netcong Bank have forwarded to Mrs. Charles Clow, of Chicago, formerly of Stanhope, who discovered Best in that city, and notified the bank, a check for $100 as the bank’s share of the reward. The American Surety Company of New York, Best sureties, have since forwarded its check to Mrs. Clow for a similar amount.